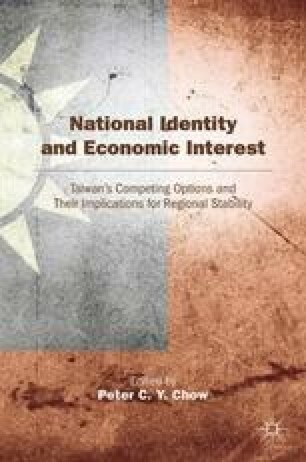 Since the end of the 1980s, two major phenomena have transformed Taiwan’s politics and economy: the rise of Taiwanese national identity and the development of a close economic interaction with China. Both phenomena result from various factors, first among them the democratization process that started in 1987 with the ending of martial law, and led to the first free election of the full Legislative Yuan (LY) by the Taiwan people in 1992. Democratization gradually allowed for the open and free expression of people’s political will and sense of identity after 40 years of repression and dictatorship by the Kuomintang (KMT). Under democracy, the people’s preferred identity turned out to differ markedly from the national identity imported from China and imposed by the KMT after 1945, and has centered instead on the his- tory, social experience, and culture of the local Taiwanese associated with the attachment to a distinct democratic society that all the Taiwanese have been building together since the 1980s. Common Wealth Magazine. 2009. “2010 State of the Nation Survey”, No. 437, December 15, 2009. http://english.cw.com.tw/article.do?action=show&id=11589.